Breastfeeding boosts baby's immune system—but that's not all. Scientists are just now beginning to understand the complex properties of breast milk, and all the advantages it gives Baby. What if there was a superfood that could adjust to fit your baby's needs, was always around when you needed it, and could even help your baby fight disease? 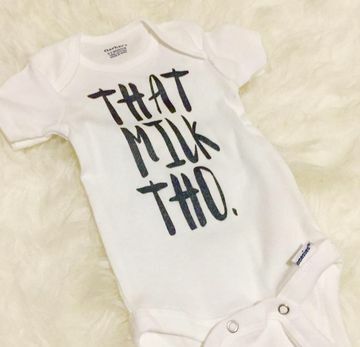 Well, there is—and yup, you guessed it, it's breast milk. Although scientists have known that breastfeeding is beneficial, they are still learning how breast milk works, as a recent review in the journal Trends in Biochemical Sciences explains. Cleverly titled "Breastfed at Tiffany's," the review puts together the scientific puzzle of the different jobs of human breast milk. "Although the main constituents of breast milk have been well known for many years, the increasing sensitivity of analytic techniques keeps finding new molecules whose significance is still unclear," co-author Thierry Hennet, Ph.D., of the Institute of Physiology at the University of Zurich in Switzerland, tells Fit Pregnancy. And even among those that are known, he says, science keeps discovering more roles they perform. For example, you might have heard that breast milk contains antibodies, which help baby fight off infection—but that's not all they do. "Breastfeeding decreases infectious diseases and infant mortality by tenfold," Hennet says. "But recent studies showed that antibodies also help develop the 'gut microbiome' by attaching to some types of bacteria, preventing their spread." This collection of digestive bacteria known as the gut microbiome is crucial in developing many other systems in Baby's body. When babies are born, their sterile guts are soon colonized with lots of bacteria. Breast milk feeds the "good" bacteria and helps prevent the spread of the "bad" bacteria—like fertilizer, Hennet says. Proteins from breast milk also act as immune hormones that help the development of the immune system. As if that wasn't enough, breast milk has other important jobs. "Breast milk also provides hormones that regulate fat metabolism and the growth of the infant itself," Hennet says. "Plus, breast milk is an optimal meal, with a balanced supply of carbohydrates, fat, proteins, vitamins and water." The next goal of research, Hennet says, is to dig deeper into the relationship between breast milk and the immune system. "We are especially trying to find out how breast milk prevents allergies and chronic inflammatory diseases," he says. Because much of the development of the gut bacteria and the immune system happens early on, Hennet believes the first breast milk is the most important. "Breastfeeding is critical in the first weeks after birth, as the infant's immune system is not mature enough to cope with environmental challenges," he says. "The constant supply of antibodies is a major source of protection. The risk of developing infections is definitively higher in non-breastfed babies than in breastfed ones." Research so far, though, has shown less about the role of breast milk later on. "The long-term benefits of breastfeeding are difficult to establish," Hennet says. "An increasing list of environmental and dietary factors influence the child's health, making it difficult to single out the exact contribution of breast milk." Because of this, he says, "it is unclear how long a mother should breastfeed her baby." So even with all the benefits, Hennet still believes the choice to breastfeed should be made by mothers, not scientists. "Although breast milk provides optimal nutrition and protection to the baby, socioeconomic factors also play a role," he says. "This is why the decision about how long women should breastfeed must be made by each family, free of any medical or social pressure." Hennet does note that the World Health Organization advises breastfeeding exclusively for six months, and then with solid food for at least another year. But these guidelines are most critical in third world countries, where women might not have access to good alternatives like formula. "The WHO recommendations are appropriate in regions of the world where the availability of balanced nutrition is limited, and where the risk for severe infections is substantial," he says. Formula is also a good choice for feeding baby, but Hennet says we still can't copy breast milk exactly, especially because it keeps adjusting to match baby's needs. "Breast milk is so complex and so dynamic—it changes during lactation—that it is impossible to create a formula replicating all its benefits," Hennet says. "Even if such a perfect formula could be made, it would be so expensive that no one could afford it! This shows that breast milk is as precious as diamonds and gold—hence my title, 'Breastfed at Tiffany's.'"